Are you "new" to the Weiser Church of the Nazarene? If you have questions about God or if you are looking for a church, we would love to meet you! We invite you to visit a Sunday service. 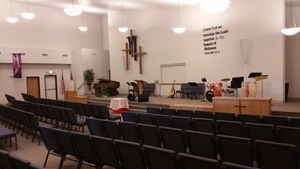 The Weiser Church of the Nazarene is not a building, it is a family of people who are a growing community of Christ–followers. If you visit us for a Sunday morning service you can expect to be greeted at the door warmly and presented with a printed bulletin so you can easily follow along with the message. If you have children, a greeter will guide you to the nursery, the preschool classes or children's service, all staffed by screened well-trained workers who will take great care of your kids. (Hey, its a free, too... an hour and a half of free childcare every week while you take in the service!). When the service begins you can expect your worship experience to include music and singing, prayer, giving and a sermon from the Sciptures - all as an act of God-centered worship. Feel free to join us in any of these ways as we encounter God together. Again, we invite you to visit with us and we look forward to meeting you.